We recently hosted our third summer cohort of Girls Who Code here at Autodesk, and I was honored to speak at their graduation to share my thoughts with them as they go back to their junior or senior years of high school. I love seeing so many young women learning to code and getting interested in tech careers. As someone who has worked in the software industry for almost 30 years, it’s troubling to me to see the percentage of women in tech going down rather than up, and I am tired of being the only woman in the room in too many of the meetings I attend. I support Girls Who Code because they are working to get more women into tech and to bring gender equality to the workplace. In conversation with the girls, I asked them about the most important skills that they learned this summer; their answers ranged from working with others to being willing to ask for help, and to being persistent in solving hard problems. Not one of them said that the most important skill they learned was coding. Their perception aligns with recent research about the skills required in our rapidly changing, digital world. While technology and coding skills are important, they are not enough. 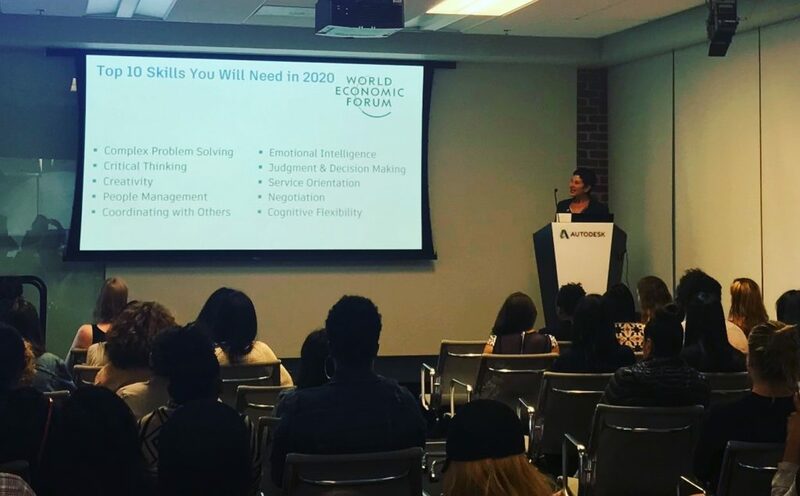 Minette Norman, VP Engineering Practice, Autodesk, delivers the keynote graduation speech to the 2018 Autodesk cohort of Girls Who Code in the Gallery. This is not some futuristic dream—these are the skills that are required in today’s workplace. When I think about developing software in a company like Autodesk, no one works alone. It takes a multi-disciplinary team to release software, including software architects, software developers, quality engineers, designers, product managers, content developers, and more. All those people need to work together, listen to one another, and make decisions together. The work falls apart without collaboration and teamwork. It requires creativity and considering all ideas. It requires critical thinking and problem solving. I told the Girls Who Code group that the best way to obtain the skills they’ll need in the future is to get a well-rounded education that focuses not only on STEM, but also on the arts and humanities. I also told them that I did not have a STEM education; I was a Drama/French double major. I value the skills I learned both in theatre and in learning a foreign language, and as I told the girls, I still use those skills to this day. All my acting training makes me comfortable speaking in public, improvising and thinking on my feet. The teamwork and collaboration required to put on a play is exactly like the teamwork required to produce software. My language training has given me a global view, with interest in and knowledge of other cultures. But times have changed since I went to college, and now it’s common to combine disciplines, to have not just a STEM education but a STEAM education. I’ve recently met university students who have double majors that combine a technical discipline with the liberal arts; computer science/Spanish and computer science/sociology are just two examples from students I talked to this summer. I urged the girls to expand their world and their education, not to have too narrow a focus. The jobs that exist today will be very different in the future, so what we need is the ability to continue to learn and to develop our uniquely human skills that will not be replaced by robots. I am so encouraged by the young women I’ve met in our cohorts these last three summers at Autodesk. Each session teaches me new things about the minds of young women and what gets them excited about all things technology-related. I look forward to our continued relationship with Girls Who Code and staying connected to and inspired by the next generation of female technologists. AI has a perception problem, but we should rethink how it will affect our future.